I’ll want to be move to Sakura’s Cloud when migrate function from Sakura’s VPS revive!! Whether I was put up flag isn’t interested. Because I wanted to make new server environment, I build a server from a first and moved data. New environment is constructed from Nginx, HHVM, MariaDB. Oh, so very splendid. I feel like a new technology. I don’t understand a difference about Mysql and Mariadb but in the case of CentOS7 I feel it was a standard specification. This is in the middle of reporting, the environment is as follows. When I review an old article with the moving of the server, I was going to set desperately the reverse DNS, and I can be completed in several minutes at initial setting of Tripwire now which took time for a few days in those days, I do it and am very fun. Rather than with my skills went up, I think the fact that OS has become convenient. This blog I had predicted the someday become to a cloud server. 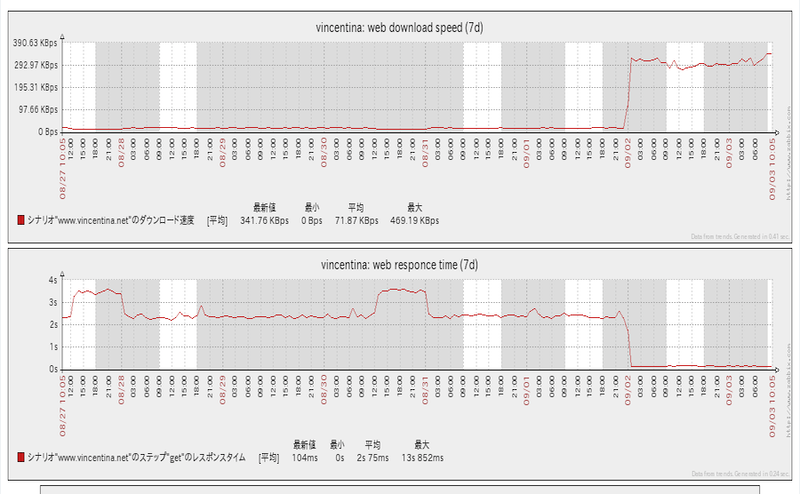 The response of the website was significantly improved, and I think that it can be well understood when we look at the graph of zabbix. However, I intend to stop monitoring of Zabbix. This is because it performs function that the monitoring by the Shell Script is enough. It is two remainder to work in VPS, and it is only DNS and Web application. Yeehaw! I nurse delusions in making Web application with great force from now on. Hmm, I may use the Sqale in web application. I wonder what I should continue managing the DNS. You should do it this way in such a case. It’s Cancellation. The day when you must decide it comes over by all means Because it is erased a data next month of the end. It is a very forcible method, which very effective for an action being slow. How about I would recommend you not to. I learned about a server and, in the beginning, I was thing who said that I could play 10 dollars so much for one month, but I used it more than 50 dollars in a month when I noticed. passage of time is very interesting. If I still continue to write the English version of the article, but I think that it is unreachable over 30,000 PV in this year, I think I want to continue further, I’ll get power beyond the barrier. This entry was posted in server on September 4, 2015 by Takeken.